Is Barack Obama the Messiah? : "I'll collect paper cups off the ground to make his pathway clear"
"I'll collect paper cups off the ground to make his pathway clear"
The true believers can “Obama-ize” just about anything. Knitters for Obama crochet for him, Runners for Obama jog for him, and Hold 'Em Barack, well, they bet on him. In Chicago, a recent art exhibit showed works depicting the candidate on canvas, paper and even in animated videos. On Etsy, a crafts auction website, you can buy Obama jewelry, paintings, and even a homemade Obama Valentine. The card shows a sketch of the candidate with the text, "I want to Barack your world." Last week, Obama attracted a crowd of 19,000 to the Kohl Center in Madison, Wis.
Four days earlier, more than 18,000 voters filled Seattle's Key Arena to see him. The 3,000 that didn't get in waited in the cold for over an hour to hear a roughly two-minute version of his stump speech. When Obama finally took the stage, the crowd roared so loudly that a local reporter in the press section covered her ears. At an Omaha, Neb., rally the day before, supporters leaned perilously over railings, screaming and crying, trying to touch Obama as he passed. During both speeches, a supporter yelled out, "I love you." This happens fairly frequently and Obama is always ready with a smooth answer. "I love you back," he says, with a quick, almost cocky smile. 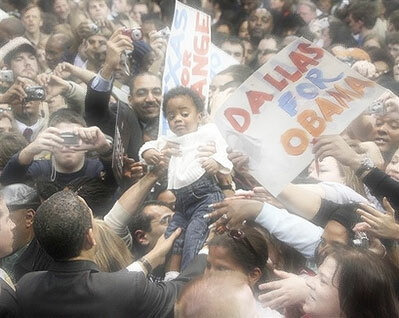 The campaign works hard to cultivate the rock star image. After he's introduced, Obama routinely waits about 30 seconds to enter the arena. "I can't really verbalize exactly what it is about him," says Avila. "Part of it is just beyond explanation." Lisa Lehrer, Politico Feb 20, 2008.